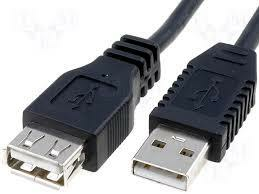 This cable is a type A male to type A female USB 2.0 peripheral cable rated up to 480Mbps. It is used to connect your USB 2.0 peripheral (printer, scanner etc) that is equipped with a type B female connector to your host computer or USB 2.0 hub. It will also work with all USB 1.1 applications..